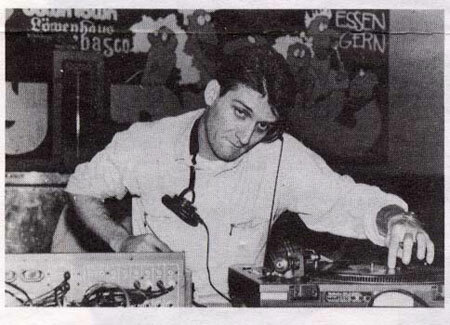 You may be wondering how and why an excursion into early 1980s Italy is in any way instructive about the slowdown in BPMs we now see, with sets from the Dons of the 90s and Noughties and their discipiles cutting the tempo lower.It is because before there were ways to create a global scene, a norm, there was no commonality. Very little to conform to. It was all local, and this particular geography is an example of what might have been today.Tempo as just a colour, in the moment, clear of any and all distractions.Beppe Loda has not got the love of the hipsters to the extent Baldelli has - limited as that may be. He is modest. In the Northern Italian style.His aesthetic, as much as one can understand it, has been classed more as 'Afro' than 'Cosmic'. 'Afro' is his term. He is big enough to realise that no sound, no scene was made by just one person - and may go by many names.This is interesting as it makes specific the fact he was riffing off of other geographic influences than might have been present in his place and time. 'Cosmic' means to the unwashed, 'weird' or 'out there'. 'Afro', back then, meant some kind of interface with the musical traditions of other places. Like Picasso referencing Benin Bronzes.Beppe Loda is to his art what Sargent is to Degas in painting. Degas is Baldelli - amazing, seminal, well seen. Sargent is harder, less friendly, sometimes even more 'commercial' as the Typhoon club had Protection in a way Cosmic did not and survived as a result for many, many years more - or at least 4. Cosmic was shut as some drugs are not happy with the Man.Four years hence, Typhoon faced the reaper for easier reasons. When one has a town of 4,000 odd, and more than twice that aching to get in to hear the sound, it becomes a massive political issue. The fact Typhoon was holed below the waterline for this basic reality has made it far less a martyr, and less cool than might otherwise have been the case.Typhoon lasted too long to get the respect it deserved.When dealing with the past, we must be conscious of our own realities, and what prejudices have come down to us. I think that if Typhoon had been busted and shunted in say 1981, Loda might have even more love from the hip than Baldelli today - though in both cases it is far too limited.So what is different betwixt them?Loda is more in touch from the start with the electronic, the real avant garde. Steve Reich and Philip Glass, sped up or not, have more a home in his world. Soundtracks, the unexpected, the kind of beats that need just a bit more tempo, or less, are legion.As are those that need no help at all.And this is where the difference may be. You listen to Loda's less loved but magic tapes, and he only uses the heavy reality of FX and pitch when it really, really needs to happen.Yet it is far darker, too.There is very little effort to make friends, even less than Baldelli. This geezer is feeling the first stirrings of the Industrial. The minimal. The Other. Fast or slow, music should take you to another place and the best of it all is far from the mainstream - yet often cannot help touching it, for a time.We will explore his tapes and wonder at what is missing next.Meanwhile, Ron Hardy is waiting in some tin and wrap and needle filled bedsit - the bridge between Italy, The Garage, The Warehouse and the Now.